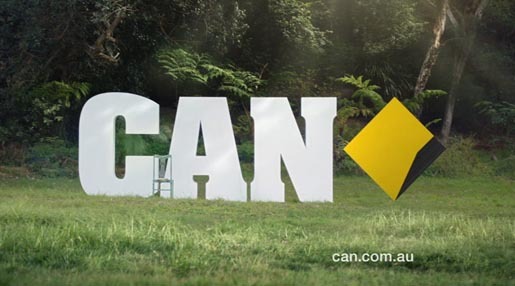 Commonwealth Bank of Australia has launched “Can”, a new integrated advertising campaign designed to reposition the brand. A television commercial, teasers, billboards, print and digital sites, centred on can.com.au, all remind viewers that the greatest impediment to progress is the word Can’t. Can, on the other hand, makes things happen. Can helps us move forward. “Whatever you want to achieve, CommBank’s technologies and know-how will help to get you there”. The rebranding exercise includes changed typefaces and colour palettes, and the official use of the name “Commbank”, a moniker already used by the Australian public. The campaign launch included full page executions and double page spreads in Sunday metropolitan newspapers across Australia. The Commbank Can campaign was developed at M&C Saatchi, Sydney, by regional creative director/copywriter Tom McFarlane, executive creative director/copywriter Ben Welsh, copywriters Paul Dunne and Andy Flemming (verse), art director Ant Larcombe, senior account director Renee Hyde, executive agency producer/head of television and content Rod James. Filming was shot by director Paul Goldman via Exit Films with producer Leah Churchill-Brown. Editor was Dave Whittaker at The Editors. Flame compositor was Stu Cadzow at FSM. Sound was produced at Song Zu.